Sorry for this late post ><. I know I said I would have it up by last night after class but I came home after class ate dinner and fell asleep like a baby haha. Better late then never right! or in my case next week! I love the eye makeup here. I think it screams FAAAALLL IS HEEERRRE! It has a shiney metallic look to it and some subtle brown. It have been doing this look everyday for the past week. I also attempted to do a broken look under my cheeks but I need to work a bit on the shading and depth I think. Instead of looking like it's sunked in it looks like it's raised haha. Be sure to click below to see the rest of the post. So I saw this Mac Face chart.. 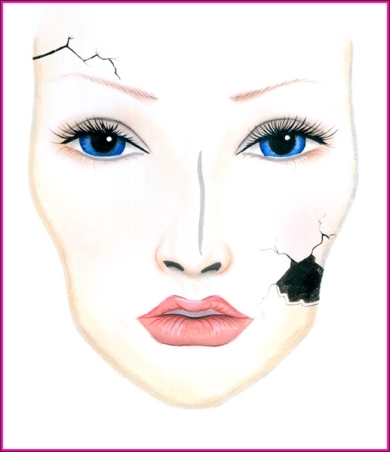 I believe it was done by MAC..
A while ago and I wanted to attempt the broken china doll look.. I failed! haha only if it looked a little more sinked in but nope.. I have the puffiest cheeks haha. I tried shading in and darkening inside and shading around but it did not work. A nice attempt though =). I really do love the eye makeup though. I will be trying this attempt again but really trying to do the doll look. I hope you guys enjoyed the eye makeup. I think it's very appropriate for fall because of the colors I chose! I also think the shimmery/metallic look of star violet opens up the eyes a little more and brings a little shine to them. Dark Shadows DVD GIVEAWAY: Enter for your chance to win a blu-ray dvd! Be sure to check out the 2 giveaways I am currently hosting on my blog (links above) and I hope you guys enjoyed this look. Stick around for more makeup and nail looks! If there is anything you would me to review or do a "first thoughts" post on feel free to let me know!